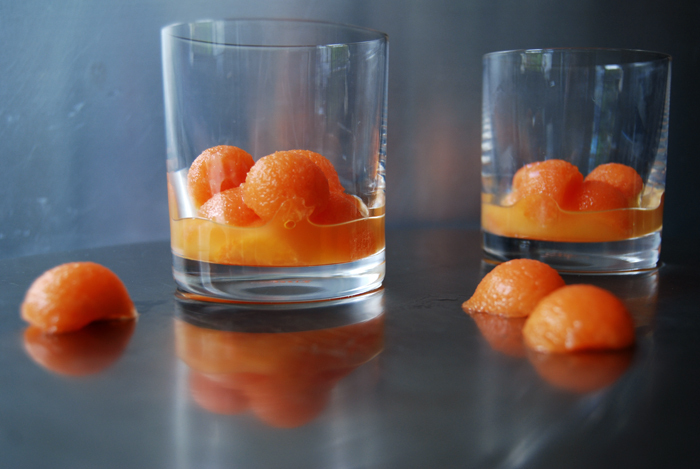 I have a weak spot for pastis, chilled with two ice cubes and a shot of water and I also use it to refine my recipes. I mentioned yesterday that I love this liqueur, it’s my favourite drink in bars and bistros. In summer it feels refreshing and in winter time I get a cosy feeling from the strong anise aroma. It’s my drink, for years now! A while ago I travelled along the Côte d’Azur in my car. One afternoon I was seduced by the sight of a lonely bay and decided to stop for a quick swim. I left all my luggage in the car (I was young and unexperienced in traveling) and went for a late afternoon swim. When I got back, the car was gone and I was left with the clothes on my body, a towel and my wallet. I was in a mess, it was the first time something was stolen from me so I did what lots of daughter’s do in a situation like this and called my mother. Crying and sobbing, I tried to explain the situation on the phone. I wasn’t in a state for a proper conversation, I felt ashamed. My mother, who is quite a pragmatic character, told me to calm down, get everything organised at the police station and then head to the next decent looking bar and have a pastis. I obeyed, the drink worked and I chilled out! In the end, I even got my car back but the luggage was gone (mine, my boyfriend’s bags were still there!). I found out that the thieves tend to take the cars to a quiet place to empty them, lesson learnt! I never left my luggage unattended in a car again but I also understood that any material loss is frustrating but not a tragedy! 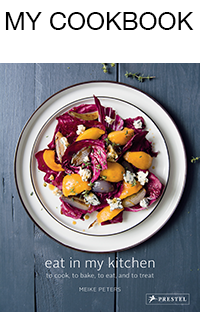 Over the years I found out that my beloved pastis has lots of potential in the kitchen, sweet and savory. 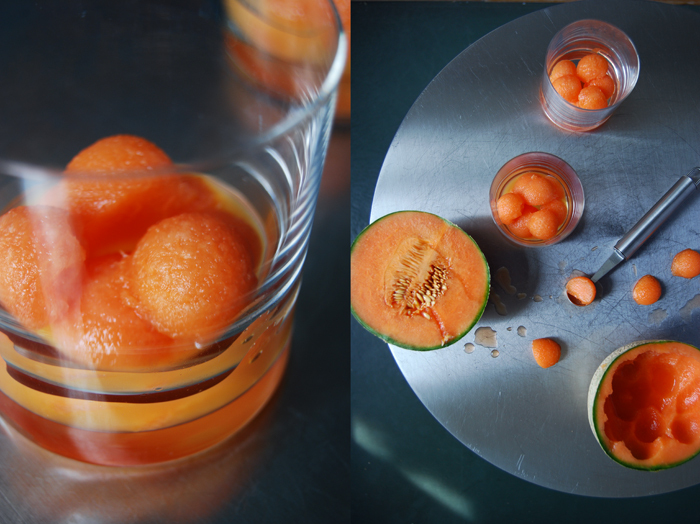 Here’s a fruity recipe which is a great summery alternative to an aperitif, sweet little balls of Cantaloupe melon in pastis! 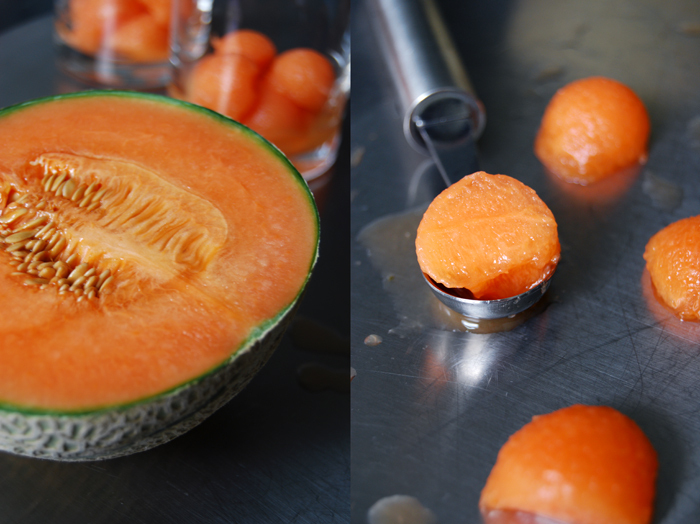 All you need is a ripe melon, either cut into cubes or scooped out with a melon baller (I found out about this strange name just a few days ago). 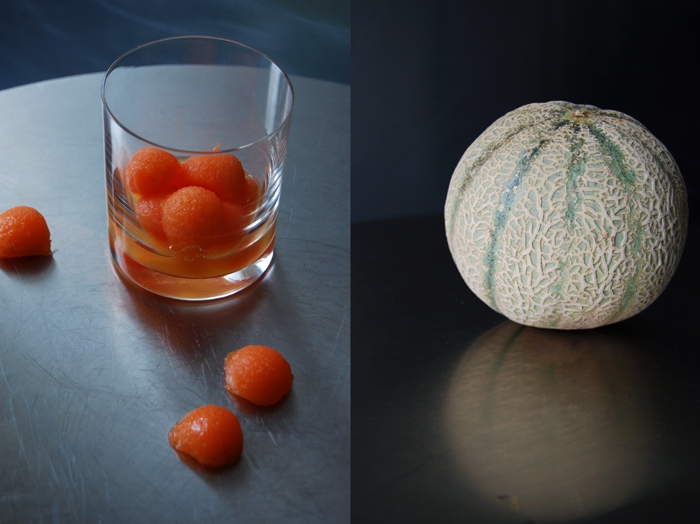 You mix the fruit with pastis and water and pick them out of a whiskey glass with cocktail picks (or toothpicks). It’s my birthday today and this will definitely be one of my treats! 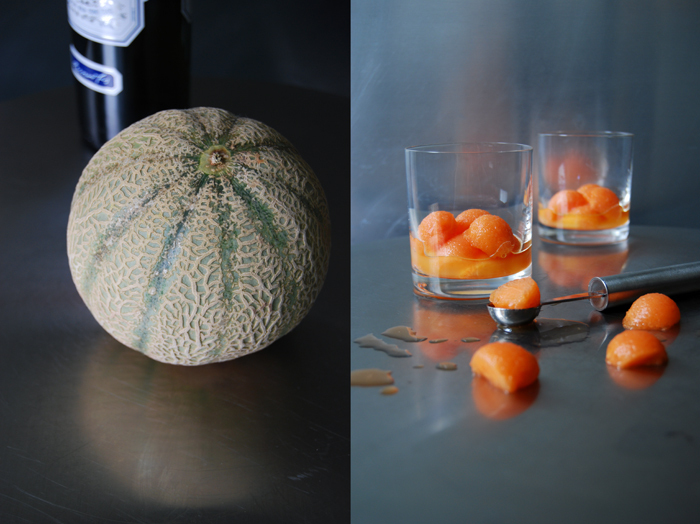 For 12 balls of melon mix 1 1/2 shots of pastis with 1 1/2 shots of water and pour over the fruit. 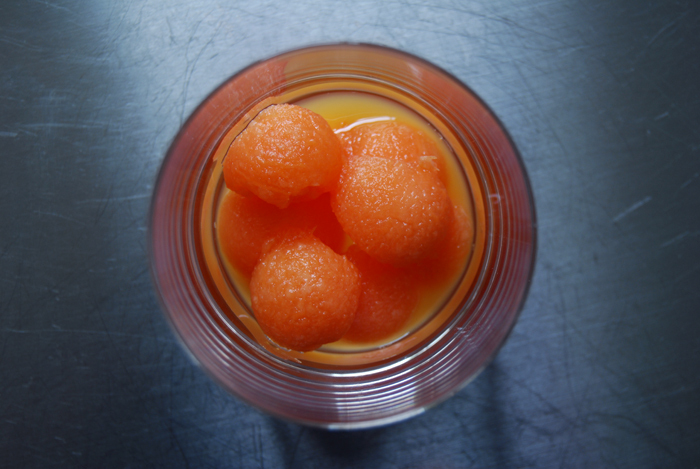 Put 6 fruity balls in a whiskey glass and fill just the bottom with the pastis/ water mixture. Serve with cocktail picks or wooden toothpicks. You can either make it fresh and serve immediately or let the fruit soak for a few hours (which will increase their alcoholic impact), in which case you should keep it in the fridge. This recipe focuses on the fruit rather than on the drink. 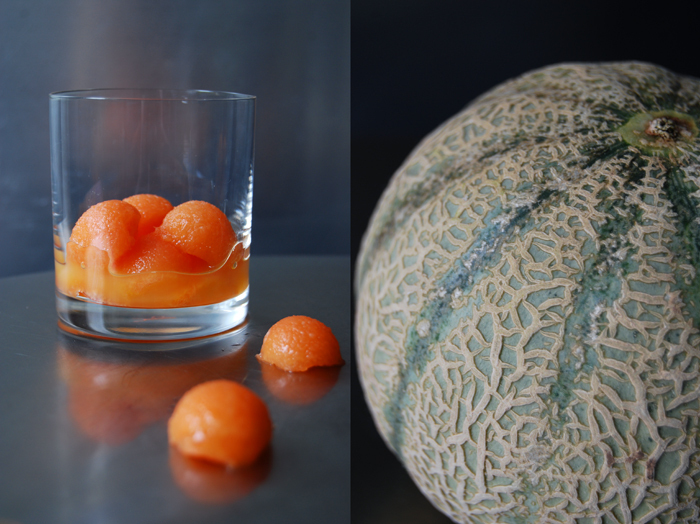 You could also make a cocktail by adding just 2-3 balls of melon to a glass of 2cl of pastis filled with water and 1-2 ice cubes.